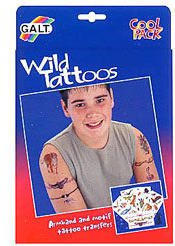 A great selection of tattoo transfers featuring fierce animals and creepy crawlies plus cord and beads to make two wristbands! Size (inches): 0.98" X 7.09" X 10.63"
Galt America is proud to bring these distinctive products to the market. Galt toys have been recognized around the world for their craftsmanship, quality and design. We hope you enjoy our full range of products as wll as our interesting and helping to stimulate history that dates back the to 1800s. Play is very important and it is universally recognized as the most significant influence on the learning process. Play helps a child to learn about the world and the environment by recognizing shapes, textures, spaces, color and by developing skills, all of which help in the development of intellectual and creative abilities. Galt Toys are specially designed to encourage and stimulate a child through play in a fun and interesting way. Galt Toys are carefully designed to meet each stage of the growing child's development. Only the best materials are suitable for ensuring each toy is of lasting quality. All items are rigorously quality controlled at each stage of manufacture to maintain the utmost standards in quality and safety. Packaging carries the Lion Mark logo confirming Galt Toys are made to British Standard 5665. The CE Mark confirms manufacture in accordance with European Safety Standards. We endeavor to put as much information as possible on our packaging. A large photograph shows the contents and activities relevant to each toy. Short sentences sum up the particular features and an indication is given as to age suitability. Where instructions are included, they are presented in a step-by step format to encourage rapid progression of skills required. Toys are the tools of play; good toys encourage, help stimulate and satisfy in play. The sign of a good toy is one which the child will return to time and time again, giving pleasure on each occasion. Parents, in recognizing the value of good toys, will search for similar qualities in their future purchases. It is our aim to supply such toys.